The aim of this accredited qualification is to provide individuals with knowledge of the basic food safety practices that are essential in the catering industry. This includes the hazards and risks to food safety presented by food operations and personnel, together with cost-effective, practical control measures. The qualification is designed principally for those who are or intend to be, food handlers working in catering. It is also appropriate for those providing services to catering premises including pest control operators, maintenance engineers, cleaners, and laundry and delivery personnel. 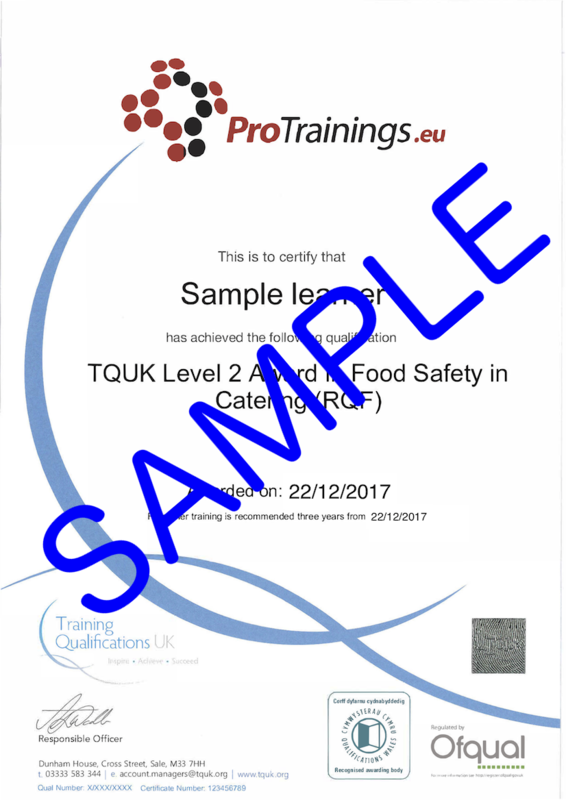 Achievement of this qualification will enable learners to identify how to make changes to catering practices in order to improve the safety of catering services. This Ofqual approved qualification has been developed specifically for insertion onto the Qualifications and Credit Framework with full support from People 1st, the Sector Skills Council for Hospitality, Leisure, Travel and Tourism. It is therefore fully compliant with industry and regulatory standards as well as being recognized by environmental health practitioners, auditors and other enforcement officers. Please be advised that the classroom course has a minimum age requirement of 16. This course comes with 8.0 hours of CPD, although the time to complete the course online may be less than this. 1.2	Describe how to report food safety hazards.